and was not re-issued his waste haulers license. scheduled meeting on Tuesday, August 12th. Jim Johnson, County Commissioner- At Tuesday's commissioner's meeting we were presented with a Notice of License Revocation, dated June 24 2008, from the Minnesota Dep't of Revenue for an overdue tax liability for Ray Pederson (Pedersons Disposal). The letter stated that "Under Minnesota Law, you must revoke the license by July 24, 2008." It also states that "once the delinquency has been resolved, we will send you a clearance certificate". The letter referenced Minnesota Statutes and seemed to be pretty clear that we had no choice but to revoke the license or we would be in violation of State Law. The letter also gave a phone number to call at the State. That number is 651-556-3327. I would urge you to call that number with your concerns. I tried the number myself and left a message yesterday. So far the call hasn't been returned. If they get enough calls that leave messages I'm convinced we will get their attention. It would also be good to contact Tim Nelson at our own planning and zoning department (387-3630) since he has been working behind the scenes with Ray Pederson to try to work this out before calling it to the attention of the commissioners last week. Bob Fenwick and Jan Hall are working with Tim Nelson to try to resolve this problem. We are having a special board meeting on Monday next week at the commissioners room at the court house at 8:30 a.m. regarding this and I would urge you to attend. Personally, I voted to violate the law and allow garbage to continue to be picked up by the Pedersons, but I was in the minority, and the resolution to revoke was passed. My reasoning for that vote, was that it was more important, especially at this time of year, to pick up the garbage than to follow the letter of the law. Hopefully, this can be resolved quickly. It would be wise to think about recycling more, and separating food waste and garbage that will spoil quickly from the other kinds of garbage that will "keep for a while" and not pose a threat to health or the environment. I'll keep you posted if I hear any more news. Hopefully it will be good news. One Island Lake Portage-The Minnesota Conservation Corp, six youth and two group leaders, yesterday head-out by canoe from the One Island Portage along the Moose Trail. Their destination- Rush Lake from where the group will spend the next four days brushing and widening the remote interior section of the Banadad Ski Trail around Moose Kill Hill. 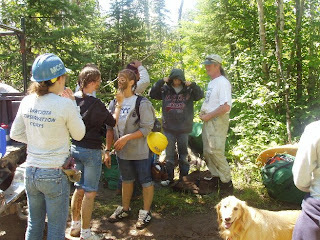 Seagull Lake, resident and winter Boundary Country Trekking employee accompanied the group to supervise the trail work. It is expected the crew should widen about a mile of the trail which when completed would finish the widening of all the remaining remote interior of the east end of the Banadad. The Annual Gunflint Trail Canoe Race Event is set for Wednesday, July 16, sponsored by the Gunflint Lake Property Owners Association. The food concession opens at 4:00 p.m. and the races begin at 6:00. Races include; long distance, traditional, backward paddling, broken paddle and gunnel pumping. The races have become a major fundraising event of the summer on the Gunflint Trail and helps raise money to equip and train the volunteers in the Gunflint Trail Volunteer Fire Department.